1. Place the chocolate, 1/4 cup of the cream, the honey and the oil in a small saucepan. Over low heat, stir till the chocolate is melted and the mixture is smooth. Transfer the chocolate mixture to a large bowl; let cool to room temperature. 2. Beat the remaining 1 cup cream till soft peaks form; gradually fold into the chocolate mixture till just incorporated. Refrigerate till set, at least 1 hour. 3. At serving time puree the raspberries till smooth, then strain out the seeds. Stir in the raspberry vinegar.. Divide among 4 dessert dishes, then top with scoops of the chilled mousse. 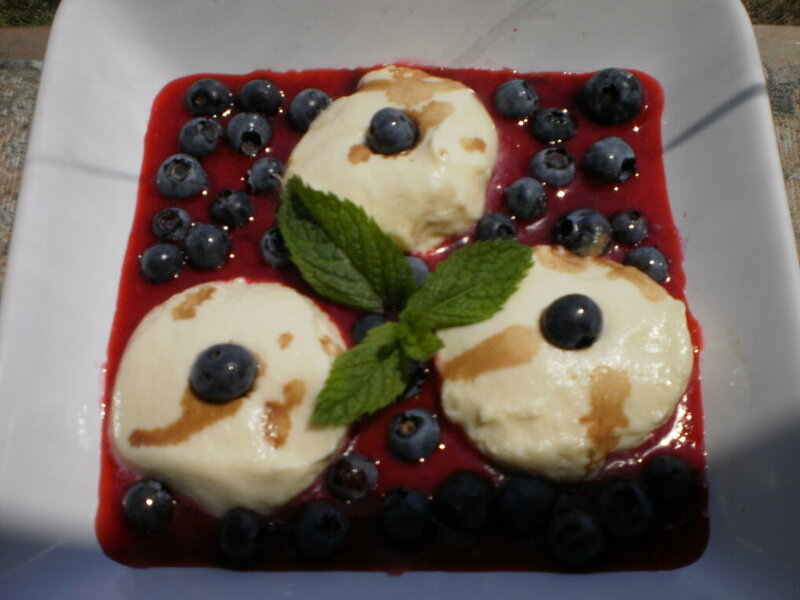 In a small bowl coat the blueberries with the balsamic vinegar; spoon over top, garnish and serve.